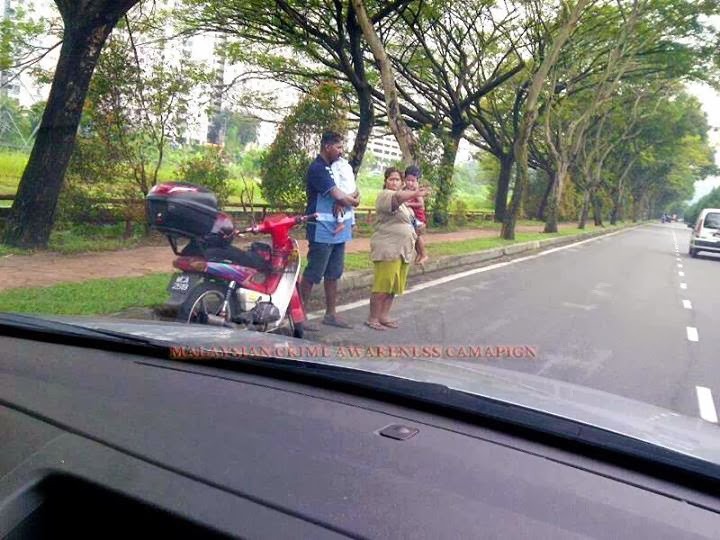 To all Residents and Communities in Selangor, Please take note of this couple anywhere around KL/PJ. They are dangerous and please do not approach them. They have been seen around Palm Spring area, Bandar Utama, Mutiara Damansara, Ara Damansara nearby Citta Mall, Sunway Damansara near the school area, Damansara Jaya school area, Bukit Tunku, Mont Kiara, Solaris, Pantai Hospital and in and around the Klang Valley. Please do NOT stop to listen, ask or help as there have been reported cases that the man in the picture will react violently. He will chase the car driver with his motor and hit the window of the car. Do not stop by the roadside or the highway alone. Do not pity them or give any money. Just report to the authorities immediately. They have been around for months. Please share this information with your friends, parents, children, neighbors and community leaders.